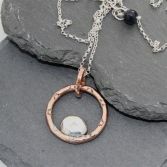 My chunky Copper & Solid Silver Pebble Necklace has been designed and handcrafted by me. 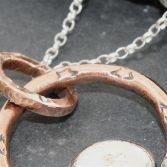 It is made with 3mm thick round copper wire to make the circle which measures 23mm in diameter. 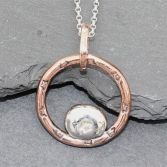 The solid silver pebble has been formed by melting silver and just before it hardens i squeeze it to create a pebble shape, it's then soldered to the circle. Both the circle and the Pebble have a star detail stamped into the metal to create a pretty contemporary necklace. The necklace is hung on a strong sterling sliver belcher chain and can be made to various lengths 16 inch, 18 inch or 20inch lengths please use the drop down below. In addition each chain will also have an 1.5 inches of extension loops, finished with a pretty Navy Blue Goldstone bead, so you can vary its length if require. 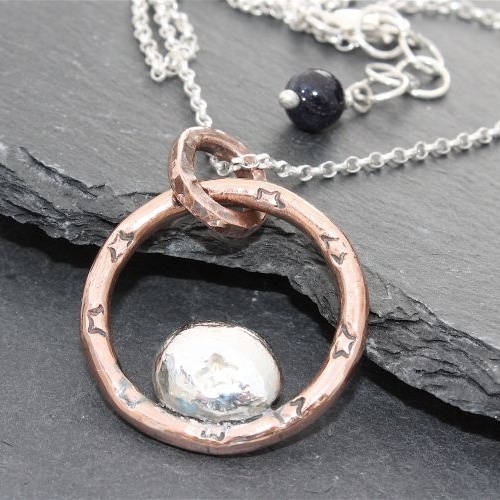 Your chunky Copper & Solid Silver Pebble Necklace will be presented in one of my signature gift box and posted free of charge to any UK address.